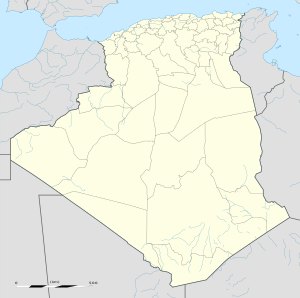 Lahmar (Arabic: اﻻﺣﻤﺮ‎) is a town and commune, and capital of Lahmar District, in Béchar Province, western Algeria. According to the 2008 census its population is 1,969, up from 1,404 in 1998, and its population growth rate is 3.5%, the highest in the province. The commune covers an area of 820 square kilometres (320 sq mi). Lahmar lies at an altitude of 939 metres (3,081 ft) on a rocky plain with scattered higher mountains to the east. One prominent range of hills is just to the east, and separates Lahmar from the nearby locality of Sfissifa. Lahmar has a hot desert climate, with very hot summers and cool winters, and very little precipitation throughout the year. Winter nights can be quite chilly due to Lahmar's altitude. Agriculture is the main industry in Lahmar. The commune has a total of 2,371 hectares (5,860 acres) of arable land, of which 930 hectares (2,300 acres) is irrigated. There are a total of 57,000 date palms planted in the commune. As of 2009 there were 8,430 sheep, 2,003 goats, and 80 cattle, the highest number of cattle for any commune in the province. There were also 106,800 chickens in 3 buildings, and 165 bee hives. 100% of Lahmar's population is connected to drinking water, 100% are connected to the sewerage system, and 99% (including 562 buildings) have access to electricity. There are no fuel service stations in the town; the nearest is in Béchar. Lahmar has a total of 607 houses, of which 361 are occupied, giving an occupation rate of 5.5 inhabitants per occupied building. This is the lowest such rate in Béchar Province. A local road leads to the provincial capital of Béchar, 30 kilometres (19 mi) to the south. Other tracks lead 25 kilometres (16 mi) north to the town of Mogheul, and 13 kilometres (8.1 mi) west to the town of Boukaïs. There is a total length of 39.4 kilometres (24.5 mi) of roads in the commune. There are 2 elementary schools, with 11 classrooms including 9 in use. There are a total of 539 school students. 3.3% of the population has a tertiary education, and another 16.3% has competed secondary education. The overall literacy rate is 88.1%, and is 92.7% among males and 83.2% among females - all the highest in the province. Lahmar has a polyclinic, a room care facility and a maternity ward. The nearest hospital is in Béchar. Lahmar has 3 operational mosques, with another 1 under construction. Sfissifa is 3 kilometres (1.9 mi) east of Lahmar. ^ a b c d "Population: Béchar Wilaya" (PDF) (in French). Office National des Statistiques Algérie. Archived from the original (PDF) on 16 May 2013. Retrieved 13 February 2013. ^ "Population, Area and Density per Commune" (in French). Official Website of the Wilaya of Bechar. Archived from the original on 22 February 2014. Retrieved 16 March 2013. ^ "Climate data for: Lahmar". climate-data.org. Retrieved 11 March 2013. ^ "Distribution of Agricultural Land" (in French). Official Website of the Wilaya of Bechar. Archived from the original on 10 July 2014. Retrieved 9 March 2013. ^ "Plant Productions" (in French). Official Website of the Wilaya of Bechar. Archived from the original on 20 August 2014. Retrieved 9 March 2013. ^ "Animal Production" (in French). Official Website of the Wilaya of Bechar. Archived from the original on 20 August 2014. Retrieved 9 March 2013. ^ "Drinking Water" (in French). Official Website of the Wilaya of Bechar. Archived from the original on 9 July 2014. Retrieved 9 March 2013. ^ "Sewerage Networks" (in French). Official Website of the Wilaya of Bechar. Archived from the original on 10 July 2014. Retrieved 9 March 2013. ^ "Electrification" (in French). Official Website of the Wilaya of Bechar. Archived from the original on 9 July 2014. Retrieved 9 March 2013. ^ "Fuel Distribution" (in French). Official Website of the Wilaya of Bechar. Archived from the original on 10 July 2014. Retrieved 9 March 2013. ^ "Housing" (in French). Official Website of the Wilaya of Bechar. Archived from the original on 4 March 2016. Retrieved 9 March 2013. ^ "Presentation" (in French). Site Officiel de la Wilaya de Béchar. Archived from the original on 16 February 2013. Retrieved 19 February 2013. ^ "Density Kilometres" (in French). Official Website of the Wilaya of Bechar. Archived from the original on 29 April 2014. Retrieved 9 March 2013. ^ "School Infrastructure" (in French). Official Website of the Wilaya of Bechar. Archived from the original on 29 April 2014. Retrieved 9 March 2013. ^ "Number of Pupils" (in French). Official Website of the Wilaya of Bechar. Archived from the original on 4 March 2016. Retrieved 9 March 2013. ^ "Structure relative de la population résidente des ménages ordinaires et collectifs âgée de 6 ans et plus selon le niveau d'instruction et la commune de résidence" (PDF) (in French). Office National des Statistiques Algérie. Archived from the original (PDF) on 17 May 2013. Retrieved 13 February 2013. ^ "Taux d'analphabétisme et taux d'alphabétisation de la population âgée de 15 ans et plus, selon le sexe et la commune de résidence" (PDF) (in French). Office National des Statistiques Algérie. Archived from the original (PDF) on 16 May 2013. Retrieved 13 February 2013. ^ "Health Facilities by Commune" (in French). Official Website of the Wilaya of Bechar. Archived from the original on 29 April 2014. Retrieved 9 March 2013. ^ "Mosques and Koranic Rooms" (in French). Official Website of the Wilaya of Bechar. Archived from the original on 4 March 2016. Retrieved 9 March 2013. ^ Journal officiel de la République Algérienne, 19 December 1984. Décret n° 84-365, fixant la composition, la consistance et les limites territoriale des communes. Wilaya de Béchar, page 1489 Archived 2013-10-21 at the Wayback Machine (in French). ^ "Souissifa, Algeria". Google Maps. Retrieved 11 March 2013. This page was last edited on 17 March 2019, at 05:48 (UTC).